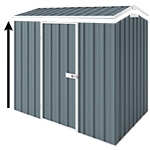 Absco's Workshop Shed is the ultimate garden shed suitable as an amazing workshop for the hobbyist or a large storage shed for the serious gardener or the home handyman. I purchased an Absco shed from Krisztian at Cheap Sheds to help solve a space issue. As a drummer for over thirty years I had accumulated a sizable amount of stuff and needed a controllable area to house it. I then created an internal frame with around a hundred l/m of pine, leaving a six inch gap around the walls and a four inch gap to the roof that was filled with 120 Rockwool insulation batts rated at R3.5. Around twenty five particle board sheets clad the walls and ceiling all held in place with 20.000 staples and hundreds of screws. Every square inch of board was then painted Mat black, the front area around the drum had additional acoustic padding added then curtaining was hung to cover this and helps defuse Hi end sound waves. Finally the floor was carpeted, although The Shed is not totally Sound Proof, we have removed around seventy percent of sound entering and a little more of sound leaving. I record not only drums but voice and other instruments for various projects but it’s also my fortress of solitude, a place I can go and write or create with out disturbing the neighbourhood. Having your own private recording studio a few meters walk from your back door has been an affordable luxury thanks to Krisztian and his Cheap Sheds. Just as a side note inside the shed or “The Cave” as it’s known, I find recording at its best in the early hours of the morning there’s no interruptions, no low end car or truck noise to invade the very sensitive studio microphones. Hi I have erected my shed,Which was a little difficult with the instructions but I am happy with the product, it is a great shed and I wouldnt hesitate to buy another if I ever need one. The communication was great and the delivery was pretty quick.